Hyperdynamic therapy, also called triple-H therapy, is the standard treatment and prophylaxis for aneurysmal-associated vasospasm. In patients who are able to tolerate cardiopulmonary stressors induced by this therapy, it is of benefit as a modality for prevention and treatment of delayed ischemic neurologic deficit. However, it can be a cause of significant cardiopulmonary or neurologic sequelae. In rare cases, it can be associated with posterior reversible encephalopathy syndrome (PRES), secondary to prolonged vasopressor and hypertensive therapies. 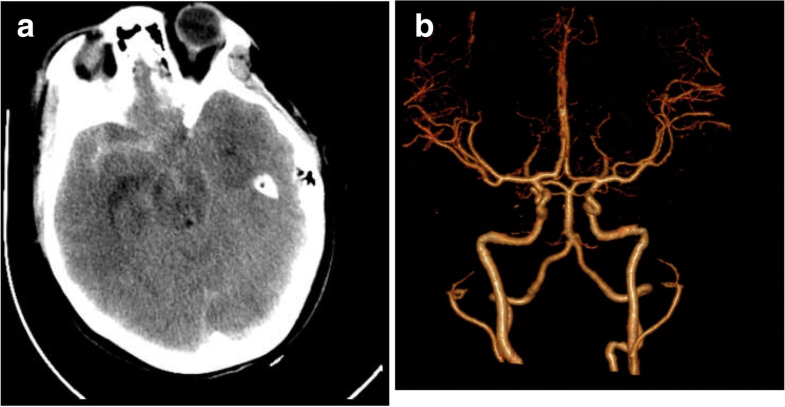 We present the case of a patient with right-sided aneurysmal-associated vasospasm who, after 10 days of triple-H therapy, experienced a seizure and was found to have left-sided PRES. Right-sided vasospasm served as a protective mechanism from triple-H therapy-associated PRES. It presented a treatment conundrum due to contradictory perfusion requirements. Hypertensive therapy was curtailed and in efforts to preserve local cerebral perfusion and vasodilation, local therapy with intrathecal nicardipine was initiated. We present our case, a review of the literature, and management considerations. Therapies that have conventionally functioned as second line treatments for aneurysmal subarachnoid hemorrhage (intra-arterial vasodilators and intrathecal vasodilators) may be beneficial as earlier treatments in the setting of vasospasm given the systemic difficulties and complications associated with HHH therapy in patients with PRES. Hyperdynamic therapy is a conventional treatment for aneurysmal subarachnoid hemorrhage-associated cerebral vasospasm. Hypertension, hypervolemia, and hemodilution are used to ensure adequate cerebral perfusion in patients with severely constricted cerebral vasculature and abnormal autoregulation. Implementation of hyperdynamic therapy however does come with risks. Pulmonary edema, myocardial ischemia, hyponatremia, indwelling venous catheter-related complications, cerebral hemorrhage, and cerebral edema are all known sequelae . A less commonly associated complication of triple-H therapy includes the development of posterior reversible encephalopathy syndrome (PRES). PRES can lead to disturbance of autoregulation, development of brain edema due to endothelial damage, and cerebral ischemia . The development of PRES can be clinically confounding as presenting symptoms may be identical to delayed ischemic neurologic deficit (DIND). Management presents a significant conundrum, as treatments of these two pathologies are directly conflicting. We present a case of a patient who had complications both of clinical and angiographic right-sided vasospasm and triple-H induced PRES. On imaging, FLAIR changes were localized solely to her contralateral parieto-occipital hemisphere suggesting that her vasospasm was functioning as a protective mechanism against ipsilateral PRES. These two coinciding diagnoses created a treatment dilemma. In this article, we present our case, a review of the literature of triple-H-associated PRES and attempt to summarize the management of patients with both vasospasm and PRES from the literature and our experience. A 33-year-old previously healthy woman presented after a sudden loss of consciousness and reported seizure. Upon arrival to the hospital, she complained of a moderate headache with severe neck pain with a Hunt Hess Score of 2. 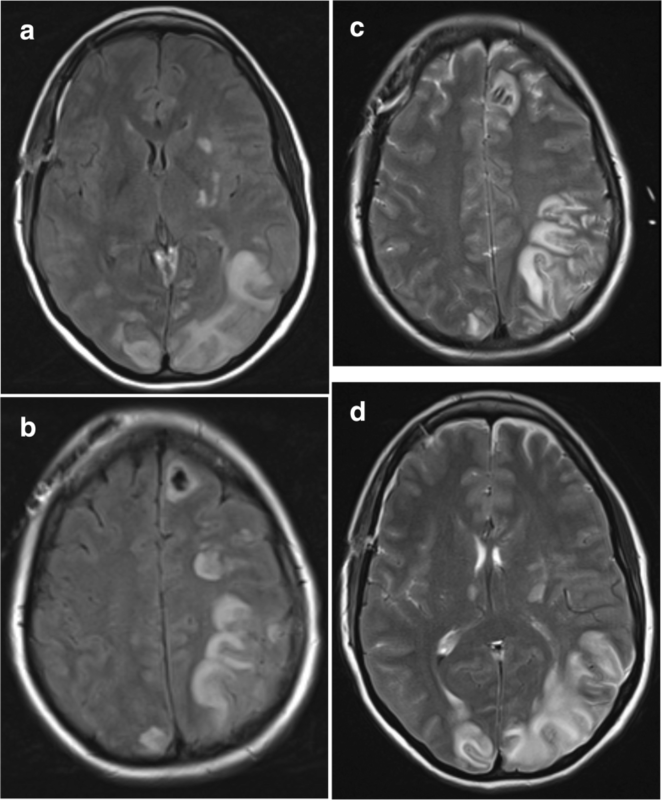 CT imaging demonstrated subarachnoid hemorrhage (Fig. 1a) from a right posterior communicating artery aneurysm. Importantly, no vasospasm was seen in the CTA from admission (Fig. 1b). She had an external ventricular drain (EVD) placed and underwent a craniotomy for clipping on post-bleed day 1. Post operatively, she was intact and monitored in the neurointensive care unit. Post-operative angiogram showed no evidence of flow-occluding spasm (Fig. 2a, b). Her hospital course was complicated by severe vasospasm of the right anterior and middle cerebral artery. On post-bleed day 5, she began to experience visual auras and complain of blurry vision. Transcranial Doppler velocities were notably increased. She underwent endovascular intervention and administration of intra-arterial (IA) verapamil resulting in improved neurologic function. Triple-H therapy was initiated and her symptoms improved despite persistently elevated right transcranial doppler (TCD) velocities. On post bleed day 15, after 10 days of blood pressure augmentation to goal systolic blood pressures of 180 mmHg, she had an acute change in neurologic exam with a mixed aphasia and disorientation. Blood pressure was increased to a goal of 200 mmHg with no significant improvement. That same day, she experienced a complex partial seizure that progressed to a generalized tonic-clonic seizure. 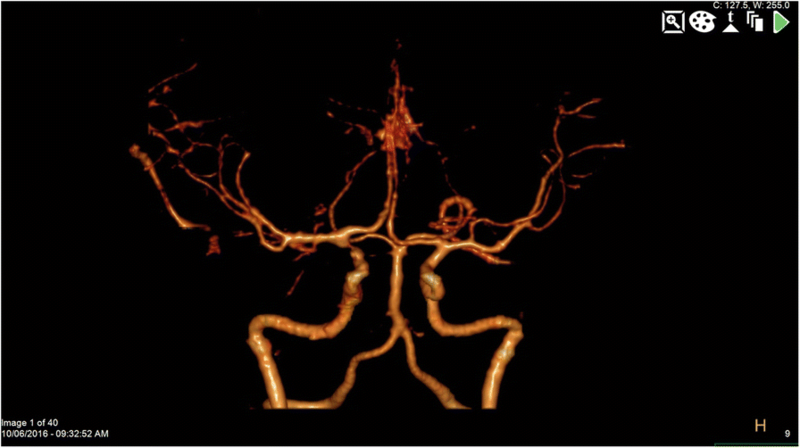 A repeat CTA demonstrated persistent right MCA spasm. An angiogram was performed (Fig. 2c), which showed vasospasm of the right ICA, MCA, and ACA, which was treated with IA verapamil. EEG did not demonstrate any subclinical seizure activity. When her aphasia failed to resolve, an MRI of her brain was performed which showed left parieto-occipital vasogenic edema suggestive of PRES (Fig. 3). Hemodilution and hypervolemic therapy were discontinued. Her blood pressure parameters were relaxed to systolic blood pressure goals of 140–160 mmHg. Given the right-sided vasospasm and the left-sided PRES, the decision was made to administer intrathecal nicardipine through her EVD. She received 2 mg of nicardipine every 8 h for five doses. Her aphasia and confusion began to improve over the next few days. Vasopressors were discontinued and blood pressure goals relaxed. She was transferred out to the floor on day 26 and discharged to an acute rehab on day 28 with no focal neurological deficits. She followed up in the outpatient clinic after 2 months and was neurologically intact with intermittent headaches. She had no further seizures. A year after discharge, she remained neurologically intact and a CTA demonstrated complete resolution of her PRES-associated cerebral edema as well as no recurrence of her aneurysm or vasospasm (Fig. 4). Hyperdynamic therapy is often utilized in prophylaxis and treatment of cerebral vasospasm after aneurysmal subarachnoid hemorrhage (aSAH) to prevent DIND. PRES is an uncommon but clinically significant syndrome that has been described in numerous case reports. The current hypothesis for a mechanism of PRES involves capillary leak in the setting of damaged endothelium. At high pressures, the intrinsic cerebral autoregulatory system fails and vessels are forcibly dilated leading to arteriolar distention and rupture of vascular endothelial cell connections. Extravasation of plasma proteins induces a vasogenic edema [3–5]. Etiologies include hypertension, pre-eclampsia, toxic drugs, immunosuppression, lupus, and renal failure. Symptoms vary widely, but most are often reversible with a reduction in blood pressure . PRES typically localizes to the parieto-occipital region, an area believed to be less capable of autoregulation secondary to less sympathetic innervation . Symptoms localize to the area affected and include altered mental status, seizures, visual changes, weakness, and if in the dominant hemisphere, aphasia. Management of PRES and cerebral vasospasm together presents a treatment challenge. The treatment for each is in direct conflict with the pathophysiology of each other. We presented a patient with unilateral vasospasm of the right ACA and MCA, with complications of vasogenic edema arising in the contralateral hemisphere. While most reports of PRES demonstrate bilateral posterior occipito-parietal hemispheric involvement, a few case reports offer similar reports of unilateral vasospasm and contralateral vasogenic edema [2, 8]. As Dhar et al. proposed, this presentation is likely the result of persistent vasospasm on one side lowering perfusion pressure effectively presenting the development of PRES on the ipsilateral site. The unaffected hemisphere however, remains vulnerable to PRES-induced edema . A literature review was performed of hyperdynamic therapy-associated PRES in patients with aSAH. The relative paucity of literature is likely secondary to the lack of standard MRI imaging performed in aneurysm patients. Awori et al. attempted to extrapolate common risk factors for patients with aSAH and triple-H-associated PRES. However, upon an extensive literature review, the cases are too few in number to establish significant risk factors . As demonstrated in Table 1, PRES seems to occur more frequently in females and on average, occurs about 8 days after initiation of hyperdynamic therapy. Dhar et al. present a very nearly identical case of a patient with right sided vasospasm receiving triple-H therapy . Workup for new confusion and aphasia included negative EEG and angiograms. MRI demonstrated significant left parieto-occipital FLAIR changes. Mean arterial pressure (MAP) goals were decreased from 110 mmHG to 70 mmHg with rapid resolution of her aphasia, hemiparesis, and orientation. She was discharged without neurologic deficits. Dhar et al. argue that, in such situations should concerns for DIND exist, more aggressive but focal therapies such as balloon angioplasty or intra-arterial vasodilators may be safer in this particular subset of patients . The authors are in agreement with this theory and suggest that should clinical presentation of both PRES and DIND be a concern, angiographic intervention may be safer for the patient. Voetsch et al. present a similar case of a patient with right MCA spasm and DIND requiring hyperdynamic therapy and intra-arterial nicardipine . Augmentation of blood pressure led to increasing headaches, lethargy, and ultimately two generalized seizures. MRI demonstrated bilateral occipital and left parietal FLAIR changes. Hyperdynamic therapy was discontinued. The right MCA territory ischemia did increase in size over the course of her hospitalization, and the patient was discharged with a moderate left hemiparesis. A review of the literature was performed to synthesize a possible treatment paradigm [2, 8, 10–14]. All authors initiated a relaxation of pressure parameters in their hyperdynamic therapy. Some reported immediate discontinuation of vasopressors while others performed a down-titration of vasopressors over several days. Most authors reported no occurrence of DIND upon a patient’s discharge. Voetsch et al. did report an increase in the size of one patient’s stroke territory after HHH therapy was discontinued . Dhar et al. address the important concept that perhaps more focal treatments in the setting of PRES and significant vasospasm may be more beneficial than the conventional systemic treatments of HHH therapy . Our patient underwent focal intra-arterial verapamil treatments and also received 48 h of intrathecal nicardipine in attempts to address both her vasospasm and her PRES. Though research remains to be performed, perhaps therapies that have conventionally functioned as second line treatments (intra-arterial vasodilators and intrathecal vasodilators) may be beneficial as earlier treatments in the setting of vasospasm given the systemic difficulties and complications associated with HHH therapy. A review of the English literature found eight studies that reported on the use of intraventricular or cisternal administration of nicardipine for the treatment of aneurysmal SAH-associated vasospasm (Table 2). Few of these studies were sufficient in number and outcomes data to know when in the treatment algorithm, intra-thecal nicardipine should be implemented. These studies show however that the use of nicardipine is not associated with significant complications. Rates of ventricular-associated infections or meningitis varied and were not consistently reported. There is some evidence that TCD velocities are improved and maintain this improvement after administration [15, 16]. In patients where traditional HHH therapy may be contraindicated including patients with PRES, this treatment modality can function as a useful resource. Anecdotally, some patients experience nausea and emesis associated with administration. Others are also unable to tolerate prolonged EVD clamp times after administration of the drug. No bleeding or infection incidents. Vasospasm refractory to standard medical and endovascular treatment. No major infection or reverse reaction. Currently other agents including intravenous endothelin-1 receptor antagonists and intrathecal nimodipine, and milrinone are being studied as agents for the treatment of vasospasm. Endothelin receptor antagonists demonstrated potential in animal studies with reduction rates of vasospasm and increase in average vessel diameter; however, an updated meta-analysis has found that it does not demonstrate overall improved outcomes . Levosimendan is a calcium channel sensitizer that has recently been shown to antagonize prostaglandin-induced vasoconstriction and upregulate the nitric oxide-cyclic guanosine monophosphate pathway thereby inducing increased vasorelaxation. Animal models have yet to be studied . Intrathecal milrinone demonstrated a successful safety and feasibility study in a study of 170 patient receiving lumbar subarachnoid milrinone injections, but further trials are required to validate this protocol [19, 20]. Intrathecal nimodipine, nicardipine, and milrinone are not yet standards of care and have not yet been proven to improve overall outcomes in conventional research. However, these therapies have demonstrated utility in specific cases of patients where the use of conventional therapeutics, including HHH therapies, lead to unwelcome complications. Intrathecal administration of nicardipine demonstrates very little systemic effects [21–23]. This case report and literature review suggest that the management paradigm of aSAH in the context of PRES should shift towards more focal modalities including intra-arterial vasodilators and intrathecal agents before reliance on HHH therapies due to the possibility of cardiopulmonary and neurologic complications. Early diagnosis of PRES in neurosurgical patients is essential for therapy modification to ensure better outcomes. No funding was obtained for this work. AR, JW, CHW, and JX have been involved in drafting the manuscript and revising it critically for important intellectual content. BM and YH have been involved in the conception of the report as well as revising manuscript critically for intellectual content. All authors have given final approval of the version to be published. All authors have agreed to be accountable for all aspects of the work in ensuring that questions related to the accuracy or integrity of any part of the work are appropriately investigated and resolved. Approved by University Hospitals Cleveland Medical Center IRB department as non-human subjects research, as appropriate for case reports. Verbal and written consent for publication was obtained from patient.